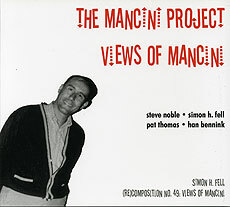 Steve Noble, turntables, manipulations; Simon H. Fell, double bass, prerecordings; Pat Thomas, piano; Han Bennink, drums. Recorded 28 January 2003 at Barefoot Studios, Brixton, London. Artwork and layout (front cover reproduced above) by SHF; Mancini photograph by Lloyd Thaxton.